As parents, we love to tend to our children’s wants and needs. It is what we do. For one recording artist, it was his children who persuaded him to record his first album in over fifteen years. For Greg Wickham, he can say “it was my kids that led me back to the studio.” To add, this was Greg’s first solo project. No pressure, right? 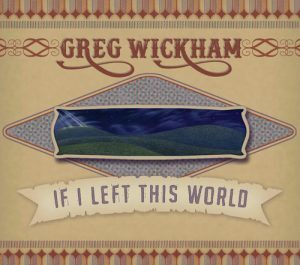 For Greg, the studio sessions are an endowment “to send each of them a more personal message they could carry with them after I’m gone.” With the help of family and friends, Greg Wickham’s new release, If I left This World, is fourteen well written and inventive tracks. If I Left This World was recorded in the exploding music scene of Kansas City, Missouri. Saturating his album with pure Americana country, Greg’s new release testifies that you don’t have to live in Nashville, New York, or London to attain distinction in the world of music. Greg opens with a cool three-quarter time piece, “Angel of Mercy, (Song for Sophie)” His choice to open with this track is spot-on. It’s light, smooth, and isn’t overproduced. Track number four, “Small Roles,” is my favorite with a classical feel to the piece. It’s beautifully written, and the cello is stylish. “If I left This World,” the title track to Greg’s album is pure country with an eye-opening a compliment from Kasey Rausch. “How Much I’ve Hurt” has harmonies that remind me of a 60’s pop music tune without losing its country flavor. It is everyone’s goal in life to leave something long lasting for their children. Many times it is money or land, but to leave a recording for your children, and their descendants is extraordinary. It’s something deep rooted that never goes away. If I left This World will have an impact on Greg’s family and fans who enjoy Americana/country music for years to come. He gave his children the perfect gift. I’m J.R. Joseph Miller with High Note Reviews, and this is Greg Wickham singing If I Left This World.